Notice the two different eyes. This theme is echoed in the book, as the authors argue that AI will work with humans in the decision-making process, not render us obsolete. 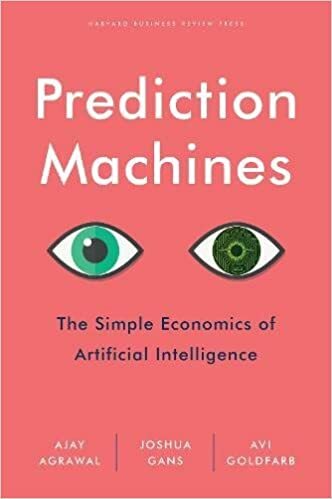 Prediction Machines: The Simple Economics of Artificial Intelligence develops a broad overview of how artificial intelligence (AI) works and how it will affect management and decision-making, the nature of jobs and the future structure of the economy, and overall social well-being. All three authors are economists, and they explore AI through this academic lens, using the language of opportunity cost, trade-offs, risk-tolerance, incentive structures, comparative advantage, and simple supply and demand functions to undergird their core arguments. In order to explain why AI is a technological advancement, the authors contrast the methods of machine learning vs. traditional statistical estimation. Traditionally, data have been used to test certain models (mostly multivariable regression), but were limited because they required ‘the articulation of hypotheses or at least human intuition for model specification’ (40). In other words, even if one has a large dataset with thousands of variables, building the best model was basically an ad-hoc, experimental process. In contrast, prediction machines can be fed the same data, without specifying a certain model, and can hunt for patterns much more quickly than any human ever could. Google’s DeepMind AI system beats Ke Jie of China, the world’s top-ranked Go player, in 2017. Researchers did not program rules for DeepMind to follow, but rather fed it thousands of Go games for the machine to learn from. According to the authors, this was China’s AI ‘Moment,’ analogous to the launch of Sputnik in the United States, where Beijing began to prioritize AI technology as a national strategic imperative (218). The authors also argue that advances in AI do not represent advancements in general intelligence, but rather a crucial component of intelligence: prediction. Prediction, as the Prediction Machines succinctly defines it, is the ‘process of filling in missing information’ (29). Any operation that takes data that already exists and generates new information is a prediction under this framework–from spotting tumors to facial recognition to choosing the content that will optimize clicks in a user’s Facebook news feed. Traditionally, accurate prediction is difficult and expensive. Experts are frequently wrong, and even still, whether doctors or financial analysts, they spend years gaining experience, commanding high salaries for their supposed ability to distinguish the signal from the noise. AI is such a valuable technology because it promises to shake up all sorts of forecasting. It is not hyperbole to state that AI will change every corner of our lives because every decision we make is predicated on some sort of prediction. AI is not ‘inventing’ prediction per se (humans have always tried to peer into the future) but is injecting more efficiency into the predictive process on two dimensions. The first component of this predictive revolution is accuracy. Accuracy improvements have been fueled by the explosion of data (there are sensors on everything now, apps collect data on millions of user habits) and more powerful computer processors (As the authors interestingly note, the conceptual roots of AI have been around for some time, but it is only more recently that we have the technological capacity to build and run such programs). AI is capable of rapidly crunching data (that didn’t exist before) to spot patterns and build models that humans simply do not have the branpower to visualize. Further, the authors stress that small improvements in prediction accuracy are often deceptive, but crucially important. Mathematically, going from 85 percent to 90 percent accuracy may be only a 5 point boost, but it also represents a drop in the error rate by one third. Improving from 98 to 99.9 percent accuracy cuts mistakes by a factor of twenty (30). Crossing such thresholds represents a ‘tipping point’ (the authors don’t use this language, but it’s fitting) and can determine whether a technology is good enough for commercial usage. This is why successful companies are trying to gather as much data of possible. In contrast to traditional modes of estimation where additional information is not all that useful (i.e. the average won’t change much), prediction machines continue to improve with the more data they are fed, allowing the AI to cross the ‘feasibility’ threshold. One example of AI improvement in the last decade has been image recognition. In AI competitions hosted by the University of Toronto, where the authors work, the best teams consistently beat the human benchmark. Similar to DeepMind and Go, these systems learn with experience (28). Along with much more accurate predictions, another component of AI technology that its fueling its rapid adoption is that it is becoming much cheaper (unfortunately, there aren’t any statistics on prices, or relative prices, or Return-on-Investment metrics). As the authors write, “Therefore, as economics tells us, not only are we going to start using a lot more prediction, but we are going to see it emerge in surprising new places” (13). Prediction is compared to the cost-reductions in artificial light–as prices crashed, it became ubiquitous. The use of prediction machines is following the same trajectory. As the authors project, prediction will become so accurate and cheap that it will not only be used to enhance firm productivity, but it will change the nature of the firm’s profit-maximizing strategy itself. For example, the authors speculate that Amazon might get so adept at predicting what we want that it sends packages before we order them, and we then have the option of returning them. 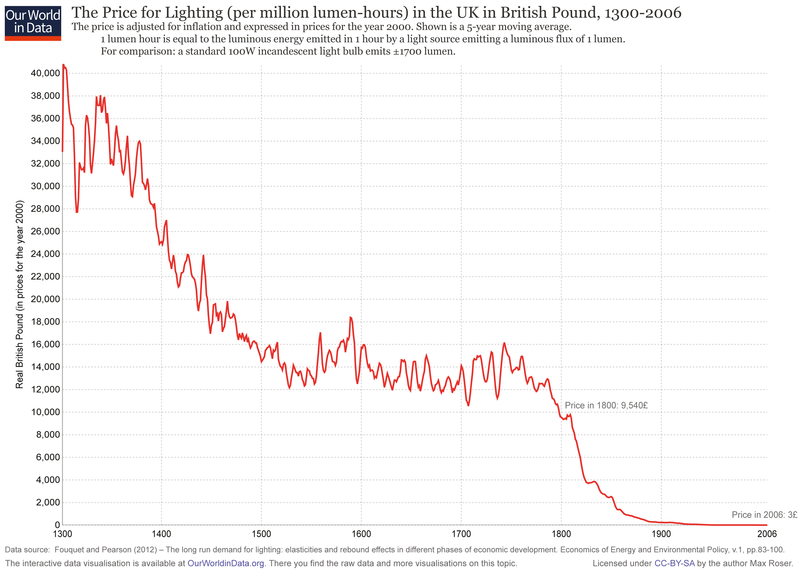 This graph traces the price of lighting over time. Observe it was relatively constant for 300 years before new innovations collapsed it to nothing. Prediction Machines argues AI technology will follow a similar trajectory, because like light, the technological churn is putting immense downward pressure on price of deploying AI systems. AI will be as important as light–and as cheap and widespread. In individual businesses, the authors argue that the value associated with human prediction will decline. However, this does not necessarily mean vast unemployment, for prediction is only part of the decision making process. In the figure below, the authors break down a decision into several parts. AI will handle the predictive elements, but the value of other functions, such as data collection, judgement, and action, will be remain in human hands (for now) and become increasingly valuable skills. The authors see a wage premium for judgement skills: “Judgement involves determining the relative payoff associated with each possible outcome of a decision… As prediction machines make predictions increasingly better, faster, and cheaper, the value of human judgement will increase because we’ll need more of it” (82). For example, AI diagnostic tools will give a probabilistic prediction of whether certain image contains evidence of cancer, but the doctor will still have make the final determination weigh different treatment plans. Certain tasks in the job description may change, but this might free doctors to become more productive in other areas. While AI will take over the Predictive Phase of a task, valuable and well-paid employees will be needed to ask the right questions of the data and machine, discern the proper course of action, and execute that action (75). One example of an occupation that grew with technology that analysts originally thought would become obsolete. While tellers don’t dispense cash, their job function has evolved into dealing with more complex customer service tasks (172). How will other professions fare? A report by McKinsey claims that half of all workplace activities could be automated, but economies are dynamic, for in addition to job function evolution, entirely new jobs and industries could be created. Further, in breaking down tasks into components allows firms to revaluate how AI could fit into their business model or change the model itself. The authors lay out this template to organize how managers can break down a certain company goal (i.e. retaining customers). In embedding AI, Predictive Machines is stressing that humans and AI, working together, can complement for each other’s weaknesses and produce superior results through teamwork. I would have preferred if the authors provided more detailed examples of how firms could use this template to rethink their decision-making processes, but given we will be looking at firms ranging from the startup to blue-chip level, I thought this template could be a useful model for the class to apply to different innovation case studies. In short, how can we break down problems into discrete chunks, and what is the best way to draw on the power of AI to elevate performance? This is a bit of a nitpick issue, but one specific suggestion I would have concerns the chapter on statistics, regression, and machine learning, which I found to be a bit unwieldy. As someone who is interested in econometrics (the study and practice of regression and economic modeling) I thought all the information presented was fascinating. However, someone without a good grasp of statistics and econometrics is at risk for getting a little lost. This is really too bad, for econometrics is really cool, and the authors should rethink how they can communicate their ideas to a wider audience. I’m an economics major and so I had enough background knowledge to understand what they were getting at, but their mistake was taking the knowledge that economists take as basic and assuming the wider public is educated on such subjects. One should not have to be an economics major to grasp economic insights, and the authors would do well to sharpen their focus and clarity in this section of the book. In the last chapter, the authors briefly explore some of the larger societal implications of AI technology. Several big issues are highlighted, including concerns about income inequality, monopoly concerns, geopolitical considerations, privacy considerations. I find AI’s relation to income inequality and monopoly issues fascinating, and these topics were kind of included as an afterthought. I was hoping for a more in-depth treatment. This does not take away from the rest of the book, which is fast-paced and peppered with cool examples, but in the final pages I was left hoping for more. Overall, I would definitely recommend Prediction Machines. In under 300 pages, the book covers a wide range of topics, giving a solid technical grounding in the current state of AI technology and exploring some of the implications for those interested in business and public policy. I think this is such a fascinating topic, and it is a great place to start! Reading this book would be a good idea to learn about the intersection between AI, workers, corporations, and the wider economy, and there are so many topics raised that it is helpful to see what piques your interest most about AI, because then you can go and explore that sub-topic. I find the point about companies trying to gather as much data as possible to improve efficency very interesting. The book I read, the Lean Startup, made a point that even though a company can gather lots of data, they need to make sure that they are using data in an effective way and presenting it in a manner that is understood by all employees to ensure mutual understanding. See you in class! I never thought of AI as technology that is supposed to be predictive before reading your summary of this book. I never realized that the concept of prediction was the cornerstone of this technology. The part about how AI will increasingly handle predictive tasks in the future and make other tasks that only humans can do more economically valuable was really interesting. As I am also interested in econometrics, this book seems very intriguing. I like how the authors mention that AI is not going to render humans obsolete, but rather help humans in the decision making process. I agree that prediction is just one component in a ‘task’ and that humans are still needed to make the correct judgment and action.Thank you for sharing the “AI Canvas”! This will be very helpful when analyzing businesses and the decisions they made/will make. Great review Charlie! This was one of the books that I was considering and after going through your review I’m definitely going to try and find time to read it. I am a big fan of the authors’ choice to specifically differentiate between general intelligence and ability to predict. That is where a lot of the economic value for AI actually comes from right now while the notion of general AI is still pretty far off. One issue I struggle with is why the authors’ argue that the need for human judgement increases as AI prediction ability increases. While specific human issues such as justice and morality I think will always require human judgement couldn’t a lot of the “judgement” done by humans be rethought of as predicting what to do to get the best possible outcome? Then it’s just another prediction problem. Regardless this book sounds really fascinating! Hey Charlie! Great blog post. I find AI so fascinating and I really enjoyed reading your summary of an economics-based take on the subject. I read Machine, Platform, Crowd last semester and it drew a lot on similar notions of the mind and machines working together, so I look forward to seeing the true outcome. Also, thank you for detailing your insights on how the book could be improved–it speaks a wise truth. See you soon! Cool post, I took econometric last semester and I found the mentioned concepts fascinating. I would definitely read this book. Thank you for sharing. The cover reminds me of The Great Gatsby haha.